I always enjoy answering emails from readers asking for help discerning prophecy theories. In the last couple of years I’ve been getting more and more requests from readers to take a look at a prophecy teaching on Youtube for them. In the past these videos were almost always the amateurish kind with text flowing on the screen slowly with distracting music. When you combine a shaky typical date-setting premise from the title with a tortuous deliver like that, I found them unbearable to watch. Lately when I click the link, it turns out out to be a video on the eternalrhythmflow Youtube channel by the prolific pretribber Scottie Clarke. Thankfully, he does not torture you with text. Instead, he narrates various images and charts such as from an astronomy program. Yet, as a pretribber his main focus is continually looking for signs of the rapture or Jesus’ return (seven years later according to pretrib thinking). As these never pan out, he has a reason to keep producing videos with new theories. Please view it with an open mind (ie ignore his conviction about what this “sign in the heavens” means for the rapture event). Rather, I’m curious what your thought is on how this very rare sign could mean to the sequence of events as detailed in your book? Like, what do you think the virgin birth event sign in the sky in Sept 2017 means? Could it simply say that 2023 is the right timing for our Lords return (and not 2030)? Are there any ‘events’ in your timeline around the 2017 or 2018 time period that could corrsepond to this ‘virgin birth’ sign in the heaven? Tim,…I’m hoping you recognize how rare this “birth” sign is (ie the gestation period of Jupiter is 41 weeks, the 12 stars crowning her head is rare, etc). The Lord provided this sign to indicate something – if it is not what Mr Clarke suggests, then what could it be? The problem with these assumptions is that they rely upon taking verses out of context and building doctrines on them. Clarke, like Mark Biltz and John Hagee, uses Genesis 1:14 as his license to look for signs in the sky. But that verse does not say to look in the heavens for signs of the end times. In context it is talking about signs for seasons/festivals, days and years (Gen 1:14 HCSB). In other words, the regular events we set our calendar by. They also use Joel 2:31 since it mentions a blood moon in the end times. But it also talks about a solar eclipse at the same time. And if you back up a verse, there is more happening than that. Wonders in the heaven and on the earth at the time of that blood moon / solar eclipse (Joel 2:30). This is parallel to the 6th seal (Rev 6:12-19) which gives even more events like a great global earthquake and shooting stars. It all points to a new cosmic object like a comet in close proximity to earth which explains the four trumpet impact disasters that immediately follow in sequence (Rev 8:1-13). Joel does not direct us to look for normal solar and lunar eclipses on the NASA table as a sign of the rapture or anything. It directs us to expect something new in the heavens interfering catastrophically with our very planet and all life on it. What people are missing who try to read prophecy into these naturally-occurring heavenly events is that Jesus already explained what the end time signs were exactly. He said nothing about singular eclipses, or four eclipses, or conjunctions of heavenly bodies. In the Olivet Discourse and Revelation he described a few events that he called collectively the “beginning of sorrows.” They are unmistakeable events that have not happened, unlike eclipses and conjunctions that happen on a regular basis. In the Parable of the Fig Tree. Jesus said these are the signs of his coming. He also said that until you see these events, his coming is not near (Mt 24:6). To understand what these “beginning of sorrows” are and what causes them, it’s important to understand Wormwood. What About The Virgin Sign? Regarding the heavenly sign of the Woman in Revelation 12, it had to do with Jesus (the manchild’s) birth 2000 years ago. It has nothing to do with the end times. You can tell this because this sign happens before the manchild is taken up to heaven, referring to Jesus’ ascension. Likewise it happens before the dragon (Satan) chases the Woman who God helps for 3.5 times, speaking of Satan’s wrath in the Great Tribulation. In fact, this “Virgin sign” is not even unique. The heavenly arrangement depicted by Rev 12:1 including the crescent moon, the sun, the woman (constellation Virgo) and the twelve star crown (“Berenice’s hair“) happen in the sky on a repeating basis. 2017 is not the first time it has happened and it won’t be the last. As this article explains, it appeared in the sky when Jesus was born, allowing us to pinpoint the exact time of his birth on the Day of Trumpets (not Tabernacles as many Messianics believe). Unique Signs Sent By God? However, even if a sign is unique, that does not make it sent by God or is a divine communication. Even unique conjunctions in the heavens are still just the result of the natural movements of the heavenly bodies. There are all manner of unique signs that have happened throughout history. Uniqueness does not make any of them signs from God, even if we can find parts of them described in the Bible in another context. In the Bible, when a sign is meant to communicate something from God, it is announced by a prophet beforehand. He also gives the meaning at that time, rather than force you to speculate what it means after the fact. This article explains that in the context of another “unique” phenomenon: major natural disasters which prophecy buffs never fail to seize upon and pronounce to be prophetic after they happen. Finally, when someone shares a discovery of a unique combination of events like this we have to remember the problem of confirmation bias. We all tend to see patterns or significance in disparate events that simply is not there. Our bias of ignoring information and aspects of these patterns that do not match our theory deceives us. When we hear someone else’s “the only way to explain this pattern is God!” theory, it’s hard to see all the things they left out that do not line up with their theory. But we don’t have to. If we just remember that creating unique events in the heavens or on earthÂ is not how the Bible shows God communicating with humanity, then we can safely ignore all speculation based on such things. The Bible already has specified how God talks to us: through certified, sign-working prophets like Moses and Jesus. What’s more, these prophets have already spoken on what the key events of the end times are. If you want to understand where we are in prophecy and if anything is near, learn and focus on those events, not the latest dazzling speculation on Youtube or anywhere else. A Key to Repentance…From Comedian Louis CK? Some years back I purchased your initial Planet X e-book, which I very much enjoyed but as we are both aware you were very much convicted for various reasons that tribulation was most likely to begin around 2010 (sorry if Im a bit off date wise, I’m going from memory and donâ€™t have my printout to hand) – I’m not knocking you for what you believed at the time but Scotty Clarke whether right or wrong has also flagged up some significant signs which are relevant, as God controls the heavens and has always used them as his â€œstory boardâ€. (The Magi certainly knew this). The current 4 blood red moons and the coming unusual movement of Jupiter in Virgo may well be heavenly markers for Israel in conflict as outlined in Psalm 83 and the coming destruction of Damascus. 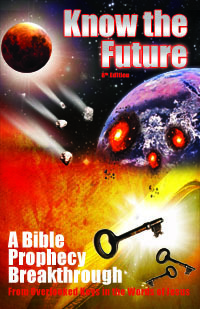 I used to hold firmly to a post tribulation rapture but as I studied further and openly considered the teachings of people like Chuck Missler on the Rapture, the weight of scriptural evidence in the bible became over whelming for a pre-tribulation rapture. However, I will concede and believe, that to an extent both views will be true as with the parable of the 10 virgins, half the believers will go in and half will go through the tribulation period. With a post tribulation understanding there can be no pre-eminence for the bride groom and from the time of the Abomination of desolation you can pretty much nail it to the day. Regarding future timings we all have the need to consider in any time line the 7 years Israel will be burning the weapons of war after the failed Magog invasion of Ezekiel 39:9. Good to hear from you again (even if you are no longer in the post-tribulation camp)! But, whoops, your memory does fail you on what I taught in my book. I still have that 2005 edition you bought in 2006 and I state no such thing about 2010 or any other year (in any version of my book). So, no mention of 2010 and even the mention of 2007 is said to be only an “earliest possible” and couched with the warning to not misinterpret these years as predictions. Which is what still happens and must have happened in your case. No biggie, it’s part of writing I have come to accept that everyone hears you differently through their own filters. BTW, I’m not surprised that my book did not set dates even as early as 2005 because I remember well how I learned by the year 2001 the very lesson about date setting that Scotty Clarke and others have not (as demonstrated by their constant new date and sign announcements). Such date-setting based on heavenly signs or Bible date calculations does not work! History shows this plainly if you investigate the past predictions men have made. So I really have never taught anything like Scotty Clarke does in my book although I admit in my book that I fell for that line of thinking with Y2K/2000 a year after I started the research that lead to writing my book. Again, this is part of why I’m so confidently against that line of thinking as I did go through it and learn it the hard way before seeing what Jesus said all along that no man knows the time (far in advance off calculations or signs, but not forever: http://www.escapeallthesethings.com/parable-of-the-fig-tree.htm). â€œIn spite of that, in the following chapters I will fearlessly both tell you exactly what I have concluded is coming and also when I expect it to, naming years. So, am I a naive or just crazy? Neither, as far as I know =). I am fully aware that posting a timeline with years on it is provocative and controversial. Yet I’m willing to do this for the following reasonsâ€¦.â€ And so on. And the time line for the beginning of 70th Week of Daniel you have a date of Set/Oct 2009 â€“ so I wasnâ€™t far off when I initially said around 2010. As for the return of Jesus if you hold a Post-trib view point then clearly you are not comparing the same thing as say John Hagee or Scottie Clarke â€“ what can only be critiqued or debunked as you say, is someones view point or date setting for the start of the 70th week of Daniel. The rapture or the catching away of the church is clearly not the same thing as Christâ€™s second coming. Anyway time will tell. Red, naivete or insanity is not needed to misunderstand the written text taken out of context as you did. Stopping at only that part indeed could give the wrong idea about the purpose of the years on my timeline as if they serve as a single timeframe expectation (which they don’t). However, other important explanations before the timeline and elsewhere in the book do clarify that that is not the intent at all of the years given. Today I wince as I read that verbiage (“assumption”, “turns out wrong”) because, being the first edition of the Roadmap, it was not as clear as it could be and was made in later editions. I was not making an assumption or prediction 2009-2016 was the 70th week (nor putting myself up to be right or wrong on that). The chart merely uses 2009-2016 as it was the next possible window of many. That’s why the instructions are given there to add seven years (and also at the end of Chapter 3) when that timeframe passes without event. Note that this is not the kind of statement you see anyone make who believes they found a sign or other evidence supporting the timeframe they are talking about. But that’s exactly what I did in the book in multiple places. Further supporting this being the intent of the years (as a template, not an expectation), note that nowhere in the book does it say that 2009-2016 must be the 70th week. If I thought that, I would have stated so plainly and given evidence and reasons why I did, like Scotty Clarke does so well. But there is no such argument in the book for why 2009-2016 being the 70th week. I wish I had made that clearer why 2009-2016 was there, as a template to build upon. I apologize my writing failed to make that clear to you. Thankfully you were in the minority. I hope this clears this up once and for all: I have not like Scotty Clarke ever put out in my book a set date based on a sign or calculation (or offered any other evidence) for the one timeframe I think people should watch or expect something or anything else. My book came out in 2005 and I learned my lesson back in 2000 and 2001 about the folly of date setting that Jesus already covered in the Olivet Discourse. BTW, I’m not knocking Clarke or anyone else either for not having learned this lesson yet. It took me a couple failures and some years to see what Jesus had said all along for myself. But I will call a spade a spade and his speculations have been going on YouTube for years with failure after failure. People have short memories or are unaware of his history unless they search specifically. The latest blood moon / “Rev 12 sign” speculation will be no different as I covered first back in 2008 here http://www.escapeallthesethings.com/2015-blood-eclipses.htm. I can say this with authority regardless of what my rapture position is. Date setting always fails unless a true prophet with a proven track record is behind it. Scotty Clarke is not that, nor am I (but I wouldn’t set a date anyway). Sorry to say Tim but you are knocking others for exactly what you profess not to do, that extract from you book is not taken out of context at all, granted you were putting in the fall back position to cover your self, that if the 70th week failed to start in 2009 then we could throw it on all another 7 years to 2016, to 2023, to 2030 .. very convenient. You may wince at your earlier writings but you clearly had more integrity, reading back over this exchange between us you are very quick to attribute any difference to my mis-understanding, my memory failing me, my filtered view â€“ the facts say otherwise but lets leave it at that. 1. You did get “2010” wrong over 2009 so yes your memory did fail you. YOU were the one who suggested this might be the case in your first post, so why blame ME for confirming YOUR suspicion? 2. You do have a pretrib view now which is a filter that tends to predispose one to antagonism against those with the posttribulation view. Look I’m giving you credit for not being a malicious person, just affected by this division in the body of pretrib vs posttrib. 3. But you did misunderstand the chart. The chart was never put up as the one true time period, but as a baseline for all possible 70th week windows in the future, hence the instructions to add seven years when the current window passes without the 70th week. You choose to ignore all these facts because they don’t fit with your story that I’m a hypocrite and wrong for exposing Clarke’s latest theory. OK, I can’t please everyone or even be understood by them properly to allow me to please them. Are we done now that you’ve been heard and answered? Red accused me being a hypocrite based on a misunderstanding of what my book said and I patiently bore with him and showed him the facts that he misremembered and misinterpreted. This makes no sense when it was written by John in the 12th chapter Revelation. If this constellation was speaking of Christ’s first arrival it would have been spoken of by a major OT prophet. Not after Christ’s death. Pointless. Riki, well a prophet did speak about that before his birth and that’s how the 3 magi knew to come when they did to the nativity (1st coming). As for the idea that it’s about the 2nd coming, you do realize that he’s not going to be born from a woman again? That’s what the sign is connected to directly: a birth! And the 2nd “point” of Revelation 12’s woman sign is context to set up the character of the woman who is on the ground fleeing after her initial appearance in the sky AND the character of Satan who tries to devour her child and all her offspring throughout history. So it has a great point indeed, context and identification of the Woman. It’s tricky, but pretty clear that it’s taking the sign out of context to relate it to 2nd coming of Jesus. Jesus was never raptured. He was never snatched away, either. Scripture says the Raptured Ones will return to rule as kings and priests in the millennial reign with an iron rod/scepture, so scripture still matches. 1 Thess 5:9 For God has not appointed us to wrath, but to obtain salvation by our Lord Jesus Christ, says the Believers will be spared God’s wrath. That’s pre-trib, not post tribulation. There are no instances where the faithful were EVER punished by God, so there’s no way they would last to be tortured during the Tribulation. Besides, the Tribulation process is for the Jews as double punishment for their apostasy. The Believers will already have been gone, and the Woman in Rev 12 (Israel) has to flee her homeland to escape persecution by satan/NWO 3.5 years into the Tribulation. The reason Israel is the Mother of the Believers, is because of her reluctance to accept Christ, during His life, this opportunity ‘conceived’ the body of Christ/the Believers at Pentecost, and the ‘birth’ of the Believers is when they become the Bride of Christ. So, yes, according to Luke, Jesus does fit the manchild because he was harpazo’ed/”taken.” He is also the only one who will “rule all nations with an iron scepter” (Rev 12:5=Ps 2:8-9). Tracy, actually my statement was correct. Rev 2:26 only says that they each saint rules with an iron scepter. It does not say the saints each rule “all nations.” Only one person “can rule all nations with an iron scepter”, of course, the Messiah. That’s exactly what Rev 12:5 describes in fulfillment of the messianic prophecy of Psalm 2:8-9. The best of the saints do get to rule a nation each under Christ. We know this from how David rules Israel when he is resurrected (Eze 37:24). The Rapture is Pre-Tribulation. It’s sound Biblical Doctrine. Felicia, who told you the pretribulation rapture was in the Bible and why did you believe them? Every verse directly on the rapture timing points to tribulation/Antichrist first then rapture/resurrection. I also came across the Rev 12 astrological event that is supposed to be fulfilled on the 23 September 2017 and not again for 1000’s years. But the big thing that they don’t see is that the second part would also have to be there – the firey dragon to consume the child! I’ve been following both Scott Clarke and Tim for many years. Neither of them have ever said “Christ WILL return on this date…..” Both guys love The Lord and are studying His word. To understand the end times takes a lot of studying. I have been studying this for over 20 years and now believe that ALL who accept Jesus as their Lord and Saviour are people who’s names are in the “Book of Life” and will eventually get to heaven. However, only those who have “OVERCOME” will “Escape all these things”. It’s probably about 10-15 per cent who will be taken after the anti-Christ is revealed. (Pre-tribulation rapture) for the WORTHY. The remaining Christians (who are worldly and are not on fire for God) will be left to go through the tribulation. Many of them understand what has happened and will be beheaded for their faith and “Overcome” during the first 1260 days. It took me many years of studying and praying for me to understand this. Some of you will understand this, some will not. Some will people will use their pre-determined ideas to try and “de-bunk” this. Study, pray and be open to what God is going to do. Time is short, Christ WILL return soon. We are NOT in darkness, so should be prepared like the 5 x wise virgins. If you’re not on fire for God, you need to re-prioritise your life. I honestly don’t care if Jesus returns pre – mid or post. It doesn’t matter, as long as we are following Him 100 per cent. How many people have you shared Jesus with this week?